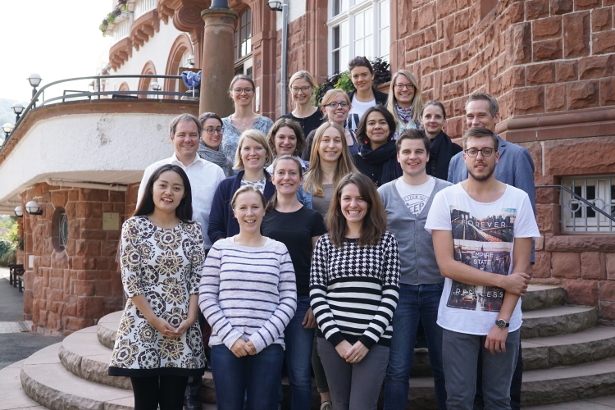 In this post, Alisa Melnikova provides some insights from this year’s Trifels Summer School that took place a few weeks ago. What can unite a sociologist, a philosopher, an economist, and an environmental scientist under one roof? The answer may be – a big interdisciplinary university or the Trifels Summer School 2016. 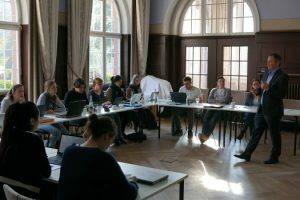 The Trifels Summer School 2016, which took place at the Kurhaus Trifels in the period from September 19th to 23rd, is an annual interdisciplinary summer school with changing socially relevant topics. The subject of this year’s Summer School was the risk-competent society. 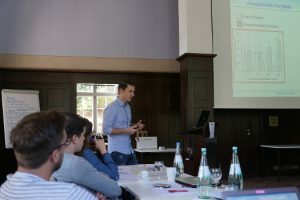 This topic brought together PhD students, postdocs and professors from different disciplines such as earth science and climate science, philosophy, German studies, informatics, and others. The interdisciplinary teamwork of PhD students and postdocs made it possible to have informative and thought-provoking discussions, and to find out how the concept of risk competence is defined in today’s society. Prof. Dr. Ralf Schulz, the Vice President of the University Koblenz-Landau, welcomed the participants with an opening presentation giving a comprehensive introduction about risk assessment of plant protection products, which are widely used in agricultural landscapes. The participants gained valuable insights into the research of risk in practice, namely, the application of various pesticides in cultivated land. In later discussions, risk assessment was revisited more than once, and thus caused great attention and interest among participants. In the next session, Prof. Dr. Christian Bermes expanded the topic with an additional aspect originating from the philosophy of risk; it means to be competent in dealing with risks. The keynote idea of his talk was the concept of cleverness. According to this concept risk competence requires sufficient expertise and continuous update of knowledge and experience update that can help in the assessment of risks and dealing with them. After that, together with Dr. Christian Dorsch the participants took part in a game called “get to know”, which helped to learn about everybody’s motivation to come to the Trifels Summer School. The participants were not only involved in different scientific fields. Some of them even came from abroad (China, Chile, and Italy), which allowed to raise the discussion to an international level. After these presentation and discussion sessions, the participants travelled from Ann-weiler am Trifels to Landau to take part in an unusual wine tasting with micro theater. The group was picked up by a “real resident of London,” who took us around the city providing insights into contemporary social problems. After five extraordinary micro-theater scenes, the group arrived at the wine house “Die Kugel”, where the participants enjoyed palatinate wines with an excellent snack in the form of huge pretzels and also learned the history of their drinks. Day 2 began with modules elaborating the main subject of the Summer School 2016. The first of them was heuristic thinking with Dr. Martin Sauerland, where approaches to learning, problem solving or discovery were discussed in detail. These employ practical methods that are not optimal but sufficient for immediate goals. Heuristic methods can be used to speed up the finding process for satisfactory solutions that are useful when working with different risks. After a short break, the participants payed their attention to the second module of this day, where M.Sc. Psych. Tim Schürmann talked about probabilistic inference models to investigate the decision-making behavior of users in cases of personal injury. His study transposes the paradigm to various questions from the work and social psychology in order to evaluate the fit between rational decision-making models and human behavior. In the last module of the day, Prof. Dr. Jan Jürjens gave a talk about the principles of modern computer security systems, particularly about servers and databases. His report is based on the concept of model-based methods and tools for critical systems software development. In the field of software quality, he works on the analysis of business process and software models. After two modules on statistical thinking and finance, the participants made a hiking trip to the Castle Trifels. Coming up the path named palatinate hills, the group met a guide who told us about the history of Trifels Castle as well as architectural and historical significance of this place. 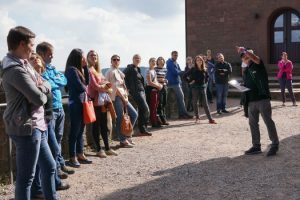 We had a wonderful tour in the premises of the castle, where we were able to immerse ourselves in the atmosphere of the early and late Middle Ages and enjoyed a good view of the Palatinate Forest and the Rhine Valley. After the hiking trip and a short break, the participants continued with a module on financial risk assessment. Afterwards, the participants were surprised with a barbecue. Participants were able to discuss important aspects of the modules in the relaxed atmosphere. Fresh air, nice dinner and good company are the best companions of the great mood, which we were in throughout this year’s Summer School. 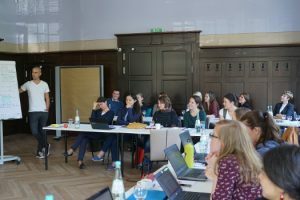 Day 4 became very eventful: module 5 started with presentations of referents from the Institute of Environmental Sciences, University Koblenz-Landau: Dr. Sebastian Stehle and Dr. Jochen Zubrod. In his talk, Dr. Stehle presented impressive results of his work dealing with environmental risk assessment of plant protection products – theory vs. reality. On the basis of his results Dr. Stehle demonstrated weaknesses in the prediction of environmental concentrations of plant protection products. Immediately after this talk, Dr. Zubrod gave a talk on effects of fungicides on aquatic fungi and the associated food web and demonstrated essential gaps in the current pesticide risk assessment. Both presentations caused a vivid discussion and active participation of students. Day 5 began with Dr. Mirjam Jenny, who is a leader of the scientific team at the Harding Center for Risk Competency at the Max-Planck-Institute for Educational Research. She presented an impressive report on medical decision-making and risk competency in digital health and cognitive modeling of subjective probability estimation. 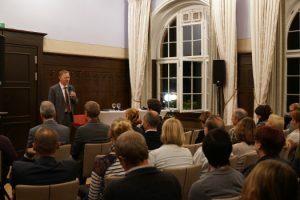 On the same evening there was a unique meeting – a discussion in the presentation hall of the Kurhaus Trifles, namely a Trifelser Gespräch (the Trifels conversation) about risk competency in school education programs. An inspiring opening speech by Prof. Dr. Ralf Schulz gave the start of an open and interactive dialogue of participants. With wonderful Rhineland Palatinate wines and snacks the participants let the evening fade away in an informal atmosphere. In the end, all participants were encouraged by new ideas and reflections about the future of education. On the last day of the Summer School there was a practical lecture by Prof. Dr. Alexander Kauertz and Prof. Dr. Sandra Nitz, who gave a workshop on education and let participants discuss in working groups aspects such as learning processes and teaching quality, handling of scientific presentations, visualisations, or analyses of professional communication processes. The groups presented their results in poster reports, which became a vivid example of practical reinforcement of working results of the Trifels Summer School 2016. During the last joint dinner, all participants shared their opinions, positive impressions of the school, shared contacts, breathed the clean air of Trifels foothills and made joint photos as a memento. The Trifels Summer School 2016 ended with saying good-bye and sending participants to their hometowns. We spent a wonderful time together that went far too quick. This entry was posted in Workshop/Meeting/Summer School and tagged environmental risk assesment, risk, Trifels Summer School on November 15, 2016 by JPZ.